We are nearing the half-year mark for 2018 and if anything, for many digital marketers the first 6 months of this year are better left behind. I’m talking about Facebook Newsfeed algorithm updates, Google and Facebook’s crypto crackdowns (and consequent account suspensions), data scandals, and the new European General Data Protection Regulation. All of which have made our lives as digital marketers just that little bit more difficult. It’s no wonder that the increasingly complicated relationship between digital marketers and Google and Facebook prompted this year’s theme at the Agora Digital Marketing Summit to be Marketing in a world without Facebook and Google. Now, that’s a strong sentiment, but the fact is that for many digital marketers it’s becoming an impending reality. So, what are our options as digital marketers when the world’s two biggest media giants are becoming over-zealous with their “community guidelines” to point of enforcing their policies with an underlying element of stringent censorship? As an SEO Specialist, the first advice I’ll give is to return to the digital asset that you have control over the most: your website. When it comes to acquisition marketing or lead generation, your website is the only digital asset that you fully own and fully control. This also makes your website your most powerful digital asset and a guaranteed safety net when things get a bit tough out there on the ad platforms. Irrespective of Google or Facebook’s changing policies, stricter guidelines and account suspensions, you’ll never need to worry about your website being shut down overnight. In fact, you can post your best and most contrarian content on your website, without being at the mercy of third parties (account reps) not understanding our content or the space you are in. And that’s where Search Engine Optimization (SEO) comes into play, because when optimized correctly, your website is a marketing channel that can bring in names that are often more valuable than those brought on through paid search. Previously, I shared 3 Easy Steps To Help Boost Your Website’s Organic Trafficand also told you how using Google Search Console can be an SEO game-changer. Today, I want to highlight SEO opportunities that are often missed. Link building is hard and it is probably one of the most difficult elements of SEO. But what if I told you there’s a way that you could potentially pick up 5, 10, or even more backlinks for a few hours’ work? People reference brand names online all the time in articles, editorial, expert opinion pieces, and reviews without actually linking to the page or product that they’re talking about. Each time I see a guru being interviewed on a huge media site like CNBC, CNN, Bloomberg or The New York Times without having a link back to their own website, a little part of me dies inside. A link back from these high authority sites can have a huge positive effect on your site’s authority and on your site’s traffic. So how do you find these unlinked mentions? There are a few brand-monitoring tools that can help you find where your guru, brand or products are being mentioned and they can also be used to set up alerts to notify you of mentions in the future. Personally, I use a combination of Moz’s Fresh Web Explorer & SEMrush’s Brand Monitoring tool. Both are paid tools, but both provide free trials if you want to check them out first, and grab your first 5 to 10 easy backlinks. I’ve also heard great things about Buzzsumo’s Brand Mention alerts tool but haven’t taken it for a test-drive yet. The SEMrush tool is my favourite because it filters out inaccurate mentions better than the other tools. If your editor has a common name, it can be time-consuming and frustrating to sieve through hundreds of results to find a handful of mentions, some of which already have links. 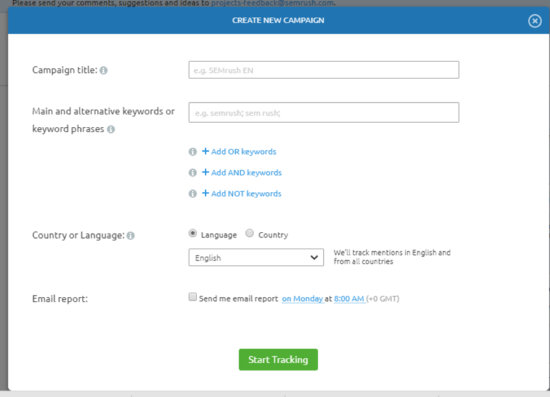 With SEMrush, you can quickly filter through results by additional targeting features. For example, if you’re tracking mentions for John Smith, you don’t want to see mentions for the UK based Kenyan professor of the same name. So, to make your search more accurate, you and applicable to the John Smith you want to target, you can include specific keywords or exclude articles mentioning John Smith and the word Professor. 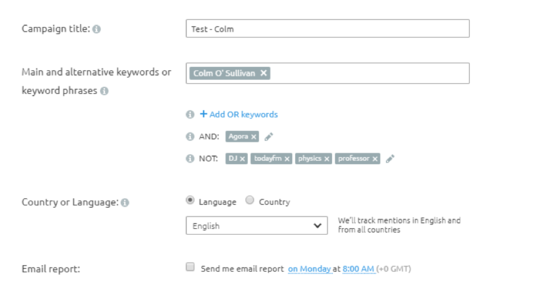 You can include & exclude up to 5 keywords so with a little tweaking, you’ll only receive the mentions that are relevant to your specific search. 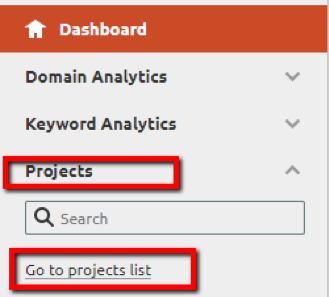 To set up brand monitoring in SEMrush, first you need to add your site as a project. To do so, simply click on Projects and Go to projects list. On the right-hand side, click on Add New Project. 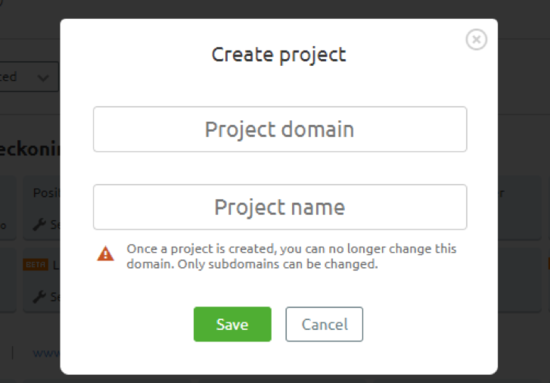 Enter your domain and the name of your website in the boxes provided, and click save. Once your website is added as a project, you need to go to Brand monitoring, under your site in the projects list. Step 1: Click into the project you’ve just created and click into Set up under Brand Monitoring. That should open up the following screen. Step 2: Enter the relevant details and click “Start Tracking”. NOTE: It’s a good idea to set up email alerts for new mentions as the conversion rate for getting backlinks is higher within the first week of the mention being published. It takes about 5 minutes from the time you click on start campaign to the time that SEMrush returns results. Once results populate, click back into Brand Monitoring. This time, it will show the number of results it found. NOTE: Depending on how big your site is, and how much your gurus are talked about elsewhere, this figure may be a lot lower. That’s OK, though. Once you click into Brand Monitoring, you need to filter by mentions with no links. That will exclude results where external sites already linked back to your website. In this example, 728 mentions were returned, with 726 having no link. I also recommend using the BM score filter to weed out poor quality sites, and to prioritize which sites will pass more authority to yours by linking back to you. The BM score measures domain authority on a 100-point scale. The higher the number, the more authority that website has. I like to break the brand mentions into 3 tiers. Tier 1, your platinum tier mentions are anything from 70 to 100. These are the links that are worth spending extra time on, and trying to build a relationship with the website mentioning you. A few of these links will have a huge impact on the authority of your site, if you’re a small website. In the example above, 175 of the 726 mentions are from sites with a BM score of 70 or more. Tier 2, your gold tier mentions. These have a BM score of 40 to 69. They are still excellent links, and in general, easier to attain than the platinum tier links. The example above has 174 mentions in this tier. Tier 3, your silver tier mentions. These have a BM score of 20 to 39. These are worth pursuing, usually very achievable, and definitely beneficial to your site, but from a prioritization point of view, they should be worked on after your platinum and gold tier mentions. In the example above, there are 47 mentions with a BM score between 21 and 39. Finally, tier 4. Your bronze tier mentions. Some of these are worth pursuing, some aren’t. Any sites with a BM score of 20 or less. In the example above there are 330 mentions with a BM score of less than 20. Use the Export tool to export the data to Microsoft Excel. I find combining the four tiers into different tabs on one Excel sheet to be very useful, when reaching out to sites. Step 4: Finding contact details for editors, authors, and website owners. I start by looking in three places. The website. Author bios and the contact us page. Using a search operator in Google. “*@domain.com” full name of the author. Matthew Barby, of Hubspot, gives some other useful tips on finding contact details, here. Step 5: Reaching out to the editor/author to get a link added. Here’s a template we use. First of all, I’d like to thank you for mentioning [Your Company or Guru’s Name] in your recent article [Link to article]. It means a lot to us! I noticed within the article that you didn’t actually link through to our website when you mentioned us. Would you mind quickly updating the post with a link? Here’s the link to save you time searching for it: [Link to Your HomePage, Guru’s bio or relevant page on your website]. It would be greatly appreciated. Thanks in advance, and if you ever need any more info on [Your Guru’s name, Company name, Product name] then we’d be happy to supply you with it [quotes, interviews, imagery, video content, etc.). This tip is short, and straightforward. If the primary goal of your website is lead generation, make sure you’ve a signup box on every post. If the primary goal of your website is to get a sale, make sure there’s an ad on every post leading the reader to a relevant promo. I’ve already mentioned the importance of internal linking in my third tip, on how to bump content from page 2/3 of Google to page 1. This tip revolves around getting traffic to your best, and highest converting pages, by using internal links. Direct your visitors to your most valuable pages. As a bonus, creating hub pages and linking to them, from other content you’ve written, will help you rank for higher competition keywords. You can read a previous article on hub page best practices, here. Kissmetrics published an awesome article with some great internal linking tips, which you can read, here. I’m pretty sure that if you follow the SEO tips I’ve shared here and in my previous articles you’ll soon see a boost in organic traffic to your website, which will help increase your website conversion rates in the long run. Just remember: SEO is a marathon, not a sprint. It takes time to see results, but the time invested will certainly be worth it in the end.